PALO ALTO, CA, U.S. — Bon Appétit Management Company, which in 2015 became the first food service company to switch to serving Fair Trade Certified tea companywide, has made another ground-breaking beverage commitment. Fueled by its Low Carbon Lifestyle program and its longtime focus on socially responsible sourcing, the company is pledging that by the end of 2021, all of its coffee-bean purchases will come either from a third-party-certified/-verified source or from vendors enrolled in Farm to Fork, Bon Appétit’s local-sourcing program. The standards the company will accept are Fair Trade, Certified Organic, Rainforest Alliance, Bird Friendly, and Coffee and Farmer Equity (CAFE). Bon Appétit will also engage with its Farm to Fork coffee roasters — which supply more than half of its coffee — to better understand their supply chains and sourcing practices, and to use that information to evaluate and update current requirements for Farm to Fork coffee roasters. The company is proud to record this commitment through the Sustainable Coffee Challenge, a collaborative effort of companies, governments, NGOs, research institutions and others to transition the coffee sector to be fully sustainable. The challenge was launched during the 2015 Paris climate meetings with 18 founding partners; it has since grown to more than 100 international partners. Bon Appétit’s new coffee commitment has its roots in the company’s Low Carbon Lifestyle program. Agriculture is both contributing to and being dramatically affected by climate change, and trouble is brewing for coffee specifically. If current coffee consumption trends continue, world production will need to double by 2050, according to World Coffee Research’s 2017 annual report. Coffee is already grown all over the world in the vulnerable equatorial belt. How it’s grown (and sourced) ranges dramatically in fertilizer use, pesticide use, habitat protection, and deforestation (or forest preservation). As Bon Appétit explored potential commitments, the company’s leadership also began to believe that the coffee policy should be about more than minimizing its contribution to climate change, and be widened to be ethically aligned with the company’s other values. In addition to protecting forests, it should include getting coffee farmers a fair price for their crop — in common practice coffee is traded as a commodity and the global price often falls below the cost of production. It should include protecting workers: the conditions they’re working under, the amount they’re paid, and the kind of community they live in. Protecting habitat corridors, waterways, and often endangered species in some of the most biodiverse parts of the world where coffee is grown also became considerations. Bon Appétit chose its third-party certifications with this range of goals in mind. There was an additional group to consider: small, local roasters. 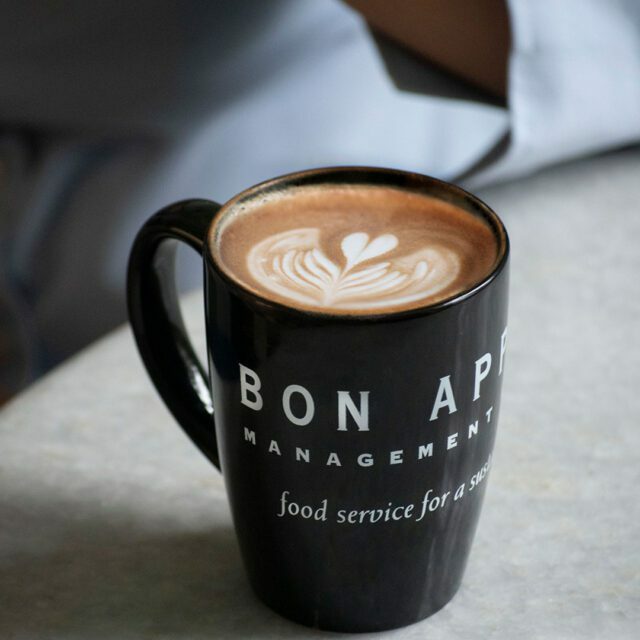 Coffee is not grown in North America, yet Bon Appétit has long encouraged its chefs and managers to source their coffee from small, local, independently owned roasters, in a special category of the Farm to Fork program it launched in 1999. (All other Farm to Fork vendors grow or raise their own products.) In fiscal year 2018, more than half of the company’s total expenditure on coffee went to these small, local vendors, many of whom already source third-party-certified coffee, such as Certified Organic or Fair Trade. But some of its Farm to Fork roasters prefer alternative methods, such as direct buying relationships, that don’t carry these recognized labels. During the timeline to transition all of the company’s coffee to these two sources, the Bon Appétit research team — Manager of Strategic Initiatives Nicole Tocco Cardwell and the Bon Appétit Fellows, led by Chief Strategy and Brand Officer Maisie Ganzler — will work with coffee industry experts to conduct an in-depth study of the hundreds of small, local roasters in its Farm to Fork program. They’ll seek to determine how much of the Farm to Fork coffee Bon Appétit buys is third-party verified, how much is not, and what other ways roasters are sourcing coffee that they believe to be socially and/or environmentally responsible (such as Direct Trade). They’ll ask roasters how they are determining the prices they pay for their coffee and if they are confident those prices exceeds the cost of production. Do they visit their farms, or rely on an exporter to select their coffee for them? The goal is that by the completion of the study, Bon Appétit will have a better understanding of what it’s like to source coffee as a small, local roaster in the United States; a more complete picture of its own coffee supply chain; and clear ideas for ways it can strengthen its Farm to Fork requirements for coffee roasters to ensure that the company is supporting sources that are ethically aligned with the company’s sustainability goals.